The Professional Regulation Commission (PRC) released the updated list of Accredited Continuing Professional Development (CPD) Providers for Mechanical Engineering (ME), one of its regulated programs. CPD Provider refers to a natural or juridical person accredited by the CPD Council to conduct CPD Programs as defined Republic Act (R.A.) 10912, "An act mandating and strengthening the continuing professional development program for all regulated professions, creating the Continuing Professional Development Council, and appropriating funds therefor, and for related purposes". Below is the updated list of Accredited CPD Providers for Mechanical Engineering and the R.A.10912 courtesy of PRC Council. Corresponding CPD unit requirements for the renewal of PRC ID will be mandatory starting July 1, 2017. For Mechanical Engineers, a total of 45 units are required to be complied every three (3) years. 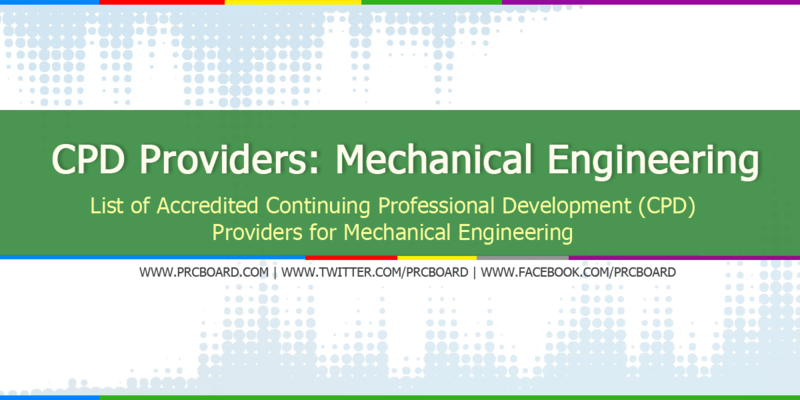 To receive updates on any announcements about CPD Providers for Mechanical Engineering, we advise our readers to bookmark this article, visit PRC official website or follow us at our social media pages via Facebook and Twitter. is there an accredited CPD SEMINAR PROVIDER here in Italy? if so, where? Thanks for the reply. May List nga... Sna iprovide nyo available trainings for CPD para makapagstart na. Hirap kelangan pa kontakin tapos wala pa palang available na program. Please provide the list of prc accredited cpd providers in Cebu area.